When God was ready to fulfill His promise and prophecy concerning the baptism of the Holy Ghost, the infusing of Himself into the lives of Christian believers, He chose speaking with tongues as the initial evidence of this baptism. Acts 2:1, 4 records, “And when the day of Pentecost was fully come, they were all with one accord in one place…And they were all filled with the Holy Ghost, and began to speak with other tongues, as the Spirit gave them utterance.” The 120 disciples allowed themselves to be completely overcome by the Spirit of God. As they did, their tongues were loosed, and they spoke new languages that they had never learned. Isaiah has prophetically described thsi experience: “For with stammering lips and another tongue will he speak to this people. To whom he said, This is the rest wherewith ye may cause the weary to rest; and this is the refreshing: yet they would not hear” (Isaiah 28:11-12). According to Peter, this experience fulfilled the prophecy of Joel: “And it shall come to pass afterward, that I will pour out my spirit upon all flesh; and your sons and your daughters shall prophesy, your old men shall dream dreams, your young men shall see visions: and also upon the servants and upon the handmaids in those days will I pour out my spirit” (Joel 2:28-29). Why did God choose the strangeness of speaking with tongues as the initial evidence of the Holy Spirit? Apparently God chose speaking with tongues for several reasons, one being that the tongue is usually the last member of the body to yield or surrender to God. it is the most unruly member of the body. James 3 says that we put buts in horses’ mouths, and by this small device we control the horse. Moreover, great ships are truned about with a small helm. Similarly, the tongue is a small member, but if it is properly controlled, it signifies the control or subjection of the entire body. But until a person’s tongue is brought under subjection, master over him is not possible. Until a person surrenders to God fully, so that God can completely control his faculties, he will not receive the gift of the Holy Ghost. The uniform, external evidence of speaking with tongues is God’s way of verifying His dominion over someone’s life. Speaking with tongues as the initial evidence of receiving the Holy Ghost (Acts 2, 10, 19) and speaking with tongues as a gift to be exercised in church meetings (I Corinthians 14) are distinguishable in function. There need be no interpretation of the tongues that people speak when they are filled with the Spirit. This experience is a personal thing between them and God and is not designed to convey a message to the church. On the other hand, someone may use the gift of tongues to speak a specific message of comfort and edification, and the church is blessed when the speaker or someone else interprets the message (I Corinthians 14:13). On the Day of Pentecost, all those who were filled with the Holy Ghost spoke with tongues as the Spirit gave utterance. They did not preach the gospel in several languages for the benefit of the hearers, for there was one gospel message preached that day – by Peter, who spoke in a language everyone could understand. In Samaria, many people were filled with the Holy Ghost when Peter and John laid hands on them in prayer. Apparently, they spoke with tongues, because Simon the sorcerer saw evidence that made him know they had received the Holy Ghost. The evidence was so remarkable that he offered the apostles money to buy the gift of bestowing the Holy Ghost on others through the laying on of his hands (Acts 8:14-19). Acts 10 tells of Peter’s preaching the gospel in the home of Cornelius, an Italian solder. “While Peter yet spake these words, the Holy Ghost fell on all them which heard the word. And they of the circumcision which believed were astonished, as many as came with Peter, because that on the Gentiles also was poured out the gift of the Holy Ghost. For they heard them speak with tongues, and magnify God.” (Acts 10:44-46). Finally, Acts 19:1-7 tells us that twelve disciples of John the Baptist were filled with the Holy Ghost and spoke with tongues. 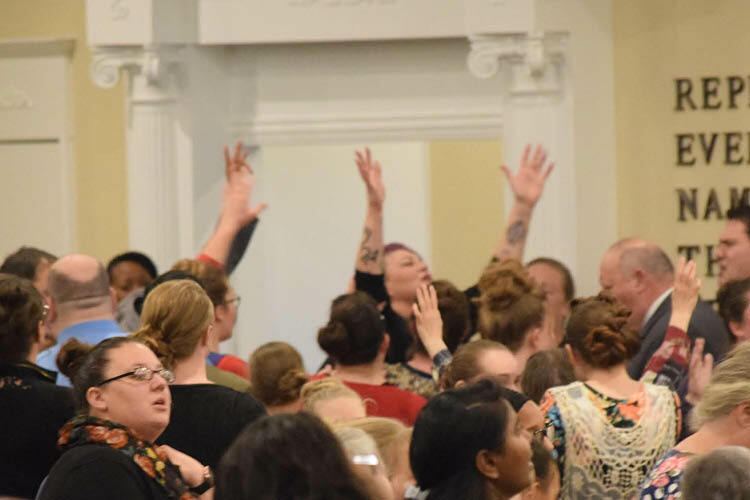 All across the land and around the world, people are experiencing the Holy Ghost baptism with its accompanying evidence. many millions have received this gift in the present century, and God alone knows how many received it from the first century until now.